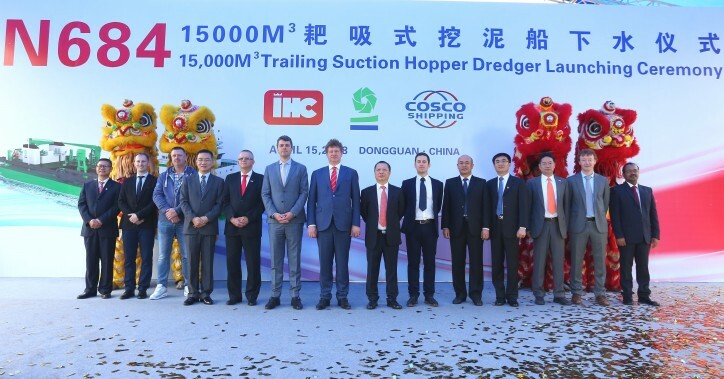 Last Sunday, April 15 2018, DEME's latest trailing suction hopper dredger (TSHD) BONNY RIVER was successfully launched at Royal IHC's partner yard COSCO Guangdong Shipyard in China. The trailing suction hopper dredger has a capacity of 15,000 m3 and a maximum dredging depth of 102 meters. The BONNY RIVER is a technically smart designed hopper dredger. The vessel combines various functions, such as the ability to dredge hard soil with its Heavy Duty suction tube combined with the ability to reach great depths with its XXL tube. 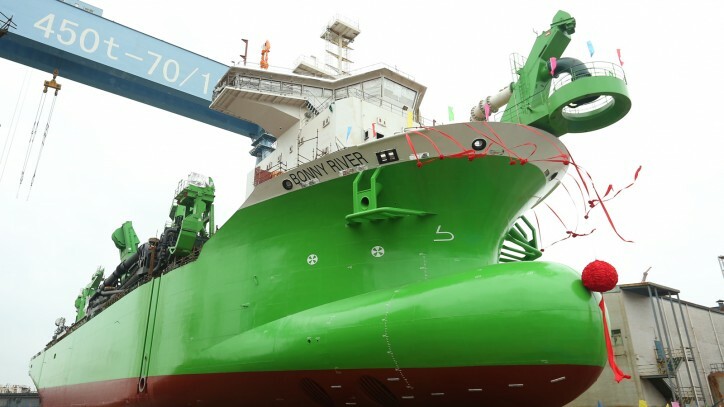 Environmentally friendly aspects such as minimizing turbulence with its closed process water circuit, installation of dual-fuel engines and CLEANSHIP & Green Passport notation make BONNY RIVER a versatile TSHD. This green flagship for DEME is ready to carry out the most demanding projects with minimal impact on the environment. This successful launching is an important milestone in the construction process of the BONNY RIVER. In the coming weeks, the ship will be commissioned and put into operation.